Special spring promotion from AMP Research! - Ford F150 Forums - Ford F-Series Truck Community. AMP Research PowerStep Running Boards need no introduction. Lots of you heard about them, some even use them already on their trucks. We have a great offer for those, who is just looking to purchase these great running boards! Save your money with qualifying product from AMP. 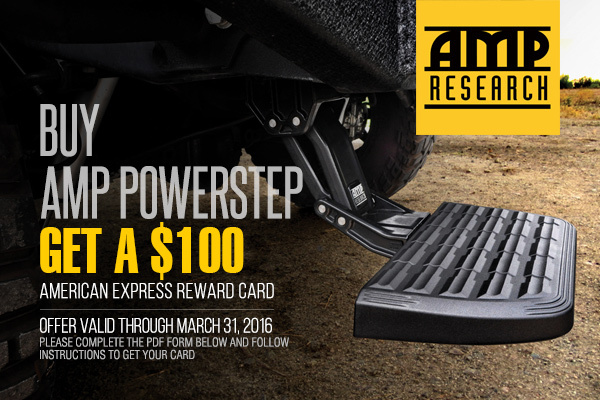 Buy any AMP PowerStep and GET $100 American Express Reward Card. Do not hesitate and make your purchase! This offer is valid from February 1 through March 31, 2016. Please complete the PDF form and follow instructions to get your card. Quick Reply: Special spring promotion from AMP Research!